This actually made me wonder: in Star Wars canon, can BB-8 and other similarly round astro-mech droids swim/propel under water? As stated, I obviously prefer answers based on canon, but well sourced answers from legends could also be acceptable. 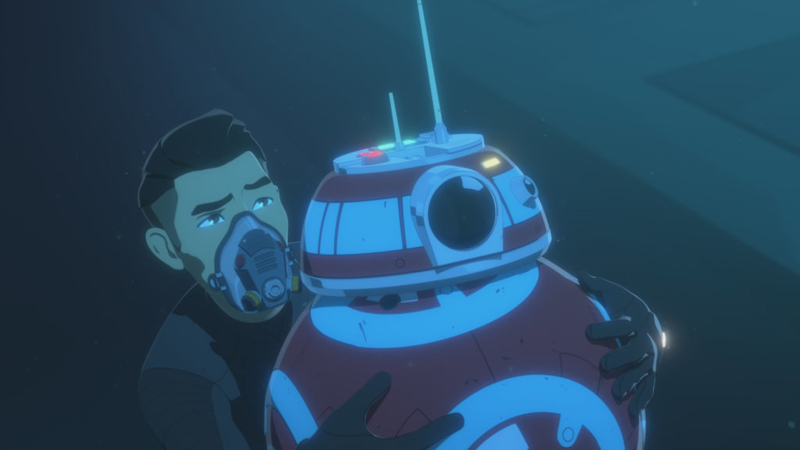 Upon consulting the canon animated series Star Wars Resistance, set in the months before The Force Awakens, the audience sees the BB unit CB-23 operate and propel herself underwater. Specifically, in the episode "No Escape: Part I," protagonist Kazuda Xiono holds on to CB-23 and she propels him through the water. It isn't exactly clear how it happens, but the droid is able to swim and do an assortment of things no problem in the water (as you can see from the image and video below). Not the answer you're looking for? Browse other questions tagged star-wars bb-8 or ask your own question. If a lightsaber is made of contained plasma, how can it deflect blaster bolts and other lightsabers? How can Rey and Kylo Ren talk to each other mentally and see each other's background? In Star Wars, are protocol droids like C-3PO water-resistant?